That time of year has fast arrived, yet again. For many, spending half term in Courchevel is looked forward to with eager anticipation for the whole of the year. For those not lucky enough to own chalets, accommodation is often booked a year or more in advance. For lots of families, whether in their own chalet or not, it’s an important week of outdoors fun with their children and an extremely special time. Now, that’s not to say it doesn’t come without its challenges! We all know that feeling when you get to the lifts, having carried all 4 pairs of your family’s skis to discover little Johnny only has one glove in his possession. It takes a lot of self restraint not to pull the plug on the whole darn holiday (this is where a chauffeur comes in handy!). But as soon as you’re out on the slopes every second was worth it. The smile on your kids faces as they feel the freedom of the ‘slide’ will make every lost glove and ski pole to the crotch justified. If you’re heading away for half term in Courchevel this year, or whether you own property in Courchevel, you’ve selected a fabulous resort for little tykes. Courchevel has received a fair bit of bad press in recent times, due to the astronomical hike in prices and designer shops moving into 1850, however the resort seems to be facing a re-branding. They’ve recategorised the surrounding lower villages (including La Perrier, just above Bozel) to incorporate them into the Courchevel umbrella. On top of this they’ve removed the altitude titles attached to the different Courchevel villages and instead have renamed them (Courchevel 1650 is now Courchevel Moriond etc). Whilst they still boast a huge array of Michelin Star restaurants, the focus is now on quality as opposed to just astronomical pricing which is a huge turn up for people who want to pay for quality. Now is great time to buy in Courchevel as they continue to develop and re-brand the resort. And that’s without even discussing the piste areas. Courchevel boasts “France’s largest children’s ski area” and puts a lot of investment into family friendly areas. With 80% of the resort above 1800m they claim a snow sure winter, and this year have installed a total of 115 new eco-friendly snowmakers so if your holiday is just one precious week a year then they’ve got you covered (or rather, the piste covered!). To keep the kids entertained on the slopes and avoid spending hours trying to follow a map, head to Courchevel Moriond (nee 1650) and into the ‘Western Park’. With a cowboys and Indians theme, there are wide cruisey slopes for them to enjoy, and if the skis get too much then they can explore with archery and tipis! Check out the kids ‘easy rider’ area map here. Whether it’s due to the weather or if their legs are just exhausted the reality is that a whole week of skiing all day every day can be tough on little legs! If they fancy a day off the slopes, avoid boredom by heading to Aquamotion. The whopping 15000sqm complex that cost £50m opened in 2016 and has not failed to disappoint. Featuring both indoor and outdoor heated pools with slides and wave pools, there is something to keep even the thrill seekers entertained from all ages – and great for mum and dad too! There is also a surf machine and an impressive climbing wall. Open 7 days a week from 1030-2030 it’s a great alternative without getting bored in your chalet! As part of Courchevel’s redevelopments they’ve this year created a new 3km luge which runs from the top of the Ariondaz bubble all the way down to Courchevel Moriond snowfront! An impressive feat and definitely not for the faint hearted! It features 8 thrill inducing tunnels and is open all day every day with the lift times, including late night openings on Tuesday and Thursday until 1930 if you fancy the extra danger of darkness! Courchevel’s fireworks still stand as some of my favourite fireworks I’ve ever seen in the world. Having first seen them when I was a child, years later they still stand firmly in my ratings. Every year the resorts host the ‘International Festival of Pyrotechnic Art’, where different countries battle it out with accompanying music and lasers to win the coveted event. 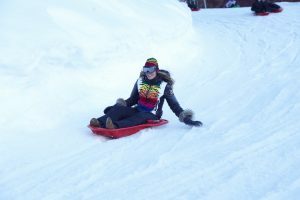 The final dates are yet to be released, but always start in February in line with half term and move between the villages of Courchevel each week. Top Tip! 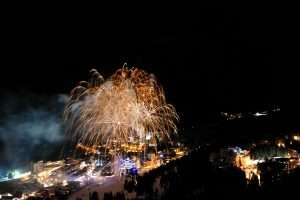 If you are staying in Courchevel Moriond, opt out of the hassle of driving and parking and hop on the bubble – they often do a special late opening for the fireworks! For more information keep an eye on their website. 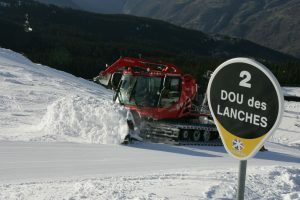 Or maybe just to keep incentives high for upcoming school exams, there are a whole host of activities on offer in Courchevel but one of my favourites that firmly stands out is the chance to ride on a Snow Cat. Even after living in the alps for a number of years I still have a profound fascination of these beasts that roam the pistes night after night. You can now learn to drive and move snow (from ages 6 up) in a controlled environment and sit in the control seat! Available from 12-2pm daily, get more information and book here. The Alps continue to develop year on year and particular emphasis is always put on children’s areas. For children in the Alps skiing is a huge part of both their education and their spare time, the community are aware of this and the importance for families on ski holidays which makes it a fabulous place to spend time as a family. Have the best time!